At Summit Preparatory Charter High School, I see many of my friends or other students on their phones checking social media. There are few groups of students who try to stay away from their phones to engage with their friends. I think it’s sad that we have to live in a world that is surrounded by so much technology. Many students use social media platforms, for example, Instagram and Snapchat. Those were two of the most used social media platforms in 2016, as stated by Priit Kallas from Dreamgrow. Students use these platforms to message their friends or to send them “Snaps,” which is sending a picture to someone on Snapchat. 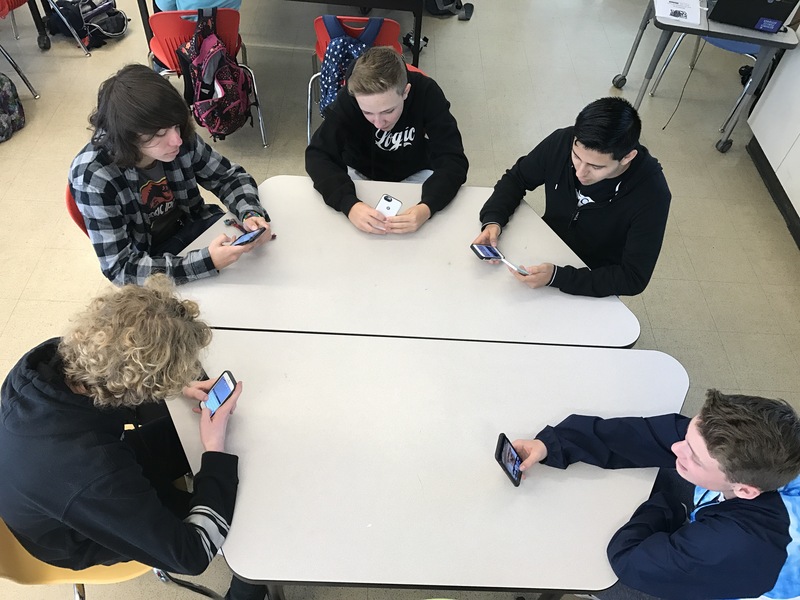 Students message each other during school while being a few feet away from each other, texting each other from different classrooms or when having a lunch break. The reason why students tend to be on social media most of the time is because they want to message someone so they won’t be bored in class. Most students want to catch up with their “Streaks” – a way to keep users on Snapchat which forces them to check their Snapchat to send Snaps to someone in order to keep their streak. Or they probably go on social media to distract themselves from class because they don’t want anything to do with the subject. CNN reporter Kelly Wallace highlighted a report by Common Sense Media, in which researchers discovered that teens in the United States spend around nine hours a day using social media for their enjoyment. Ms. Wallace also wrote that nine hours is more than the average teen sleeps and more time than they spend being around teachers or parents. Students should spend less time on social media in order to be successful in school. If they do not achieve their goals for school, then they could fail their classes due to using social media during school. Grades of the students could drop heavily. Nick McGillivray, from TurboFuture, wrote that users that are light users of social media have improved grades, with an average GPA of 3.82, while heavy users tend to suffer with their grades, with an average GPA of 3.06. Another study McGillivray quotes showed that students who studied for a test while on social media scored 20 percent lower. When I am in a class, some students are on their phone viewing social media when class is in session. When they can’t put away their phones, the phones are taken away and given back to them at the end of class or at the end of the day. The moment when students don’t have their phones, most of the thoughts that are going through their heads focus on all the messages they aren’t responding to, causing them to worry how that will affect streaks with their friends. If that problem affects the way they think during class, it could affect the way they are learning in class; for example, if a teacher asks them a question, they wouldn’t be able to answer. With many students, social media affects their relationships with friends and teachers; for example, you can’t have as much fun on social media as you can being with friends in real life. If your teacher sees you every day on social media, then they won’t see you being productive like other students, and they won’t think highly of you. Many teachers would look up to you or give you the respect that you need if you weren’t on social media all the time. During school, I wish it was possible to convince students to spend less time on social media and to instead be with their friends more often. If that ever happened, there would be more friendships coming together, and there would be more communicating with people instead of looking at a screen to talk to someone. Talking to someone would be easier, and it would also invite other students around you to jump in the conversation. If students weren’t always on their phone checking social media, many parents and teachers would be proud that they are taking a change and deciding to go without social media. Teachers and parents would possibly give out more responsibilities to students because they are letting go of social media for a change. My parents gave me responsibilities throughout life as I grew up, but they haven’t given me many since they see me on my phone a lot. I think that if I can show them that I can be responsible around them, and even when they are not around, they would trust me more and probably would give me the things I always wanted. I personally think it would be the same if other students did the same. If students were to let go of social media more often and engage with others, teachers, friends and family would see the change in them and would be more interactive with them. There would be more interaction with one another and that would also improve friendships with fellow students. This is the reason why social media has affected student’s lives, and we should try to end this to make a better future for them.